UK Loss assessors providing professional help with insurance claims to the public and businesses, dealing with insurance company loss adjusters for maximised settlement, reduced time and stress, free initial consultation, no win - no fee. two profiles were found for Certifiedclaims.co.uk in social networks. Among other social networks the website is represented in Facebook and LinkedIn. The web server used by Certifiedclaims.co.uk is run by Gyron Internet Ltd and located in Great Britain. This web server runs a few other websites, mostly in the english language. 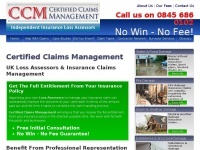 The websites of Certifiedclaims.co.uk are hosted by a Apache server and were developed in the programming language PHP. The HTML pages were created with the latest standard HTML 5. The website does not specify details about the inclusion of its content in search engines. For this reason the content will be included by search engines.